I did think about calling this Splat Chicken?! But this roasted chicken is truly divine and deserves more reverence, although as I type this I’m still tempted to rename it…maybe? Tell me your thoughts in the comments… This magnificent dish oozes flavour and comfort and the smell alone of the beautiful combo of garlic, butter, herbs and chicken gently roasting is reason enough to try this dish. Believe me. The garlic is the superstar of this dish and is blanched first. I’ve recently come across this technique of blanching garlic and I am now totally hooked. Spatchcocking a chicken is a fantastic way to guarantee a perfect evenly roasted bird. No more dry breasts. It’s also super quick. If you thought Spatchcocking was reserved just for using on a grill then think again. It is a very proficient way to roast and also makes a great a centerpiece and talking point to any roast dinner. Buying a whole chicken is a very affordable way to buy organic meat. I always buy are large bird and use the left overs in salad/lunches, the bones for bone broth and if there’s enough a chicken curry or soup. If you quickly research online you’ll usually find one of the supermarkets has an offer on organic chicken, I’ve recently found some at 25% off making it the same price as free range, so I’ve bought a couple and put some in the freezer. Now on to the not such great thing. Well for some of us. The process of Spatchcocking. Of course you can A. get your butcher to do this, or as I usually do B. get your other half or tougher friend. I’m really not one for blood and guts but I thought I’ve gotta do this myself if I’m going to blog it. Toughen up Tabitha.. .. And I’m pleased to report there was very little blood and guts. Not that I’d go so far to say I enjoyed it but it was well worth the end result and hey if you don’t like the sound of it , hey you’ve got nothing to prove so use option A. or B. Or those of you game, follow these simple instructions or YouTube it (as I initially did). Have fun my chicken lovers! I promise this is much less grizzly than it sounds and remember there is always options A and B. Also if you’re not too keen on handling raw chicken (like me) you can use disposable plastic gloves. Place the chicken breast side down. 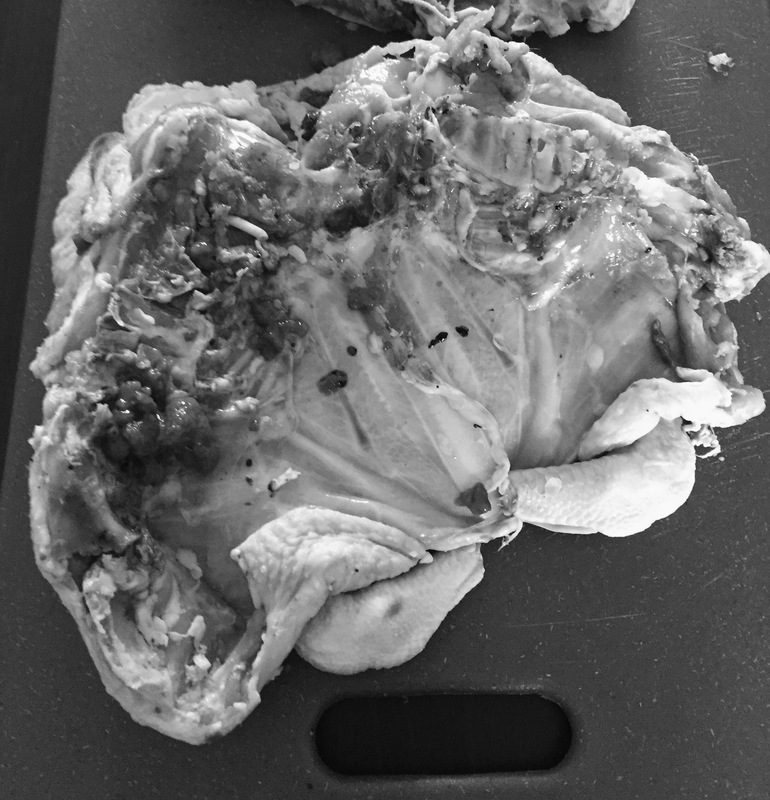 Then with a good knife or sharp kitchen scissors cut along from one end of the chicken to the other alongside each side of the backbone, through the ribs. Then completely remove the backbone. You can use this for stock or freeze it to use in the future. Finally turn the bird over and press down on the bird until it is flat. Ta da. One perfectly spachcocked chicken! This chicken is succulent, oozing garlic and butter than infuse every inch of it. Once you try this, it will become the only way you roast your chicken. Break the two bulbs of garlic into separate cloves leaving the skin on all except ½ of one of the bulbs cloves and put these on one side. Blanch the cloves with skin on by covering them with cold water bringing to the boil then draining the water and adding new cold water and repeating the process. Do this 3 to 4 times. It might sound crazy but it will make the garlic taste amazing. 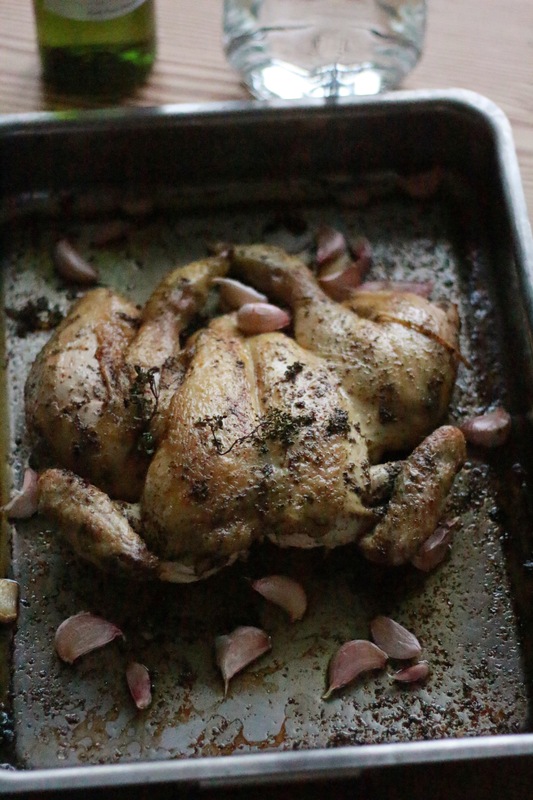 Take the peeled garlic cloves and rub over the spatchcocked bird and cover with 2 x tablespoons of the olive oil, salt, pepper, lemon juice and zest and add the blanched garlic cloves to the pan before sprinkling over the thyme and oregano. Add the rest of the olive oil and butter to large pan (that will hold the whole bird). Turn the heat up and then brown the bird on each side until it is golden. Then leave the chicken to rest (ideally covered in foil) for 10 mins whilst you sautee the roasted, blanched garlic cloves in a little olive oil and butter until golden. Place your roasted spatchcoked chicken on a large serving plate or carving board in the centre of the table. Let everyone pick the piece of the chicken they wish to eat and pour over the amazing divine gravy of chicken juices and garlic. Yum. 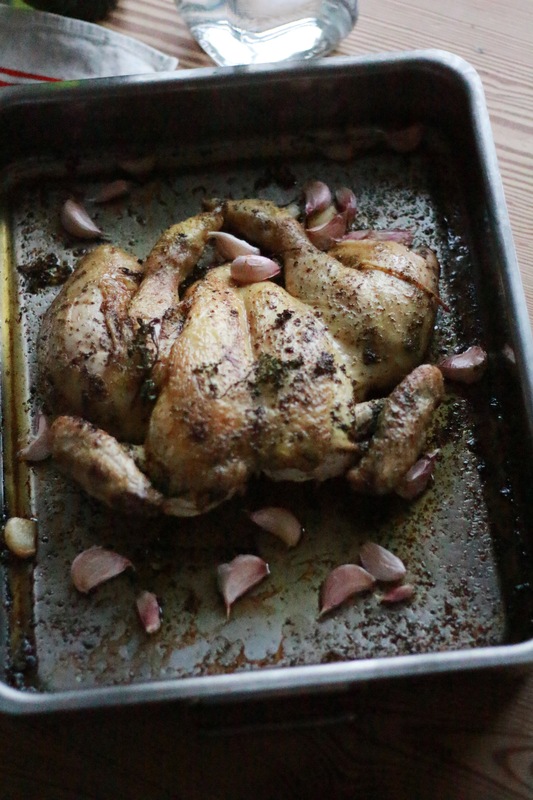 Notes: This scrummy roasted chicken will keep well covered in a fridge for up to 3 days. One final tip, don’t start talking about spatchocking chickens after a couple of glasses of wine.. it could become a bit of a tonge twister! I keep seeing spatchcock chicken recipes and am seriously starting to wonder if someone up above is trying to send me a sign. Plus, this might be a fun alternative to turkey for Thanksgiving this year. Those are just excuses though, I really want to try this because your recipe sounds delicious and the pictures are making my mouth water haha. Ha ha brilliant. Thank you for stopping by and unhook you love it. It’s in the oven Tabitha!